While the new Juke and e-NV200 received considerable attention on the Nissan stand at the Geneva Motor Show recently, it was the new X-Trail that dominated for many. The new model combines Nissan's acclaimed 4x4 heritage with fresh ideas and technologies inspired by the brand's ground-breaking crossover models. Together they form a car that could actually redefine the compact SUV segment. Built on the new, jointly-developed Renault-Nissan Alliance common module family (CMF ) platform, the new X-Trail is just as tough and accomplished as the previous generation model, but adds crossover style and efficiency, exciting design, innovative technology and exceptional comfort. Nissan's desire to make the new X-Trail the most comprehensive offering in the C-SUV sector provided the driving force behind the car's bold new design. Fitting perfectly into the brand's vision of modern crossover SUV styling, the new X-Trail features a striking new look that defines Nissan's latest design language. Inside, the new X-Trail offers a completely new environment for occupants. Designed from the very outset, including seven seat (optional ), the cabin features a raked theatre seating layout that ensures every passenger has a great view out. Featuring premium materials and intelligent design throughout, the new X-Trail sets new standards for rear seat access, space for optional third-row passengers and in-car technology. In a previous article I informed readers that the new Qashqai would not have an accompanying seven-seat version, so this new X-Trail will fill that void for Nissan. Powering the new X-Trail is a powerful yet frugal dCi 130 engine that delivers strong torque and excellent refinement at all speeds. Available in two and four-wheel-drive forms, the latter features Nissan's latest-generation all mode 4x4-i transmission. Coupled with Nissan's new chassis control system and Nissan safety shield, the new X-Trail's drivetrain provides the driver with a comprehensive network of safety and comfort features that ensure every journey is an enjoyable one. 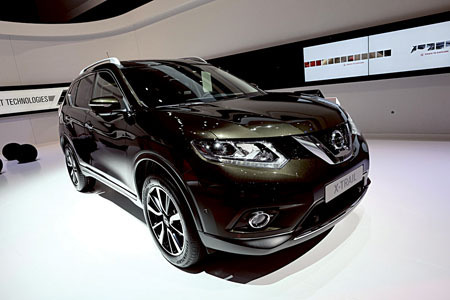 The new X-Trail will play a highly significant role in Nissan's growing crossover family. It will be built at nine different manufacturing sites around the world for a vast array of markets. Globally, its predecessor was one of the company's biggest selling vehicles, and the new version is expected to surpass it.